On the afternoon of the 18th June 1815, before one o'clock, Field Marshal Prince Blucher had joined Bulow von Dennwitz's IVth Corps at Chapelle- Saint-Lambert, to the northeast of the battlefield. Despite the pain and exhaustion resulting from Ligny, he personally reconnoitered the approaches to the French right flank. But he could not move quickly, nor were his decisions fast in coming, and it was not until 4 P.M. that Bulow's first two brigades were seen debouching from the Bois de Paris. At a point close to the farm of Frischermont they started heading in the direction of Plancenoit, some three kilometers away, along the southern end of the hastily extended French right. 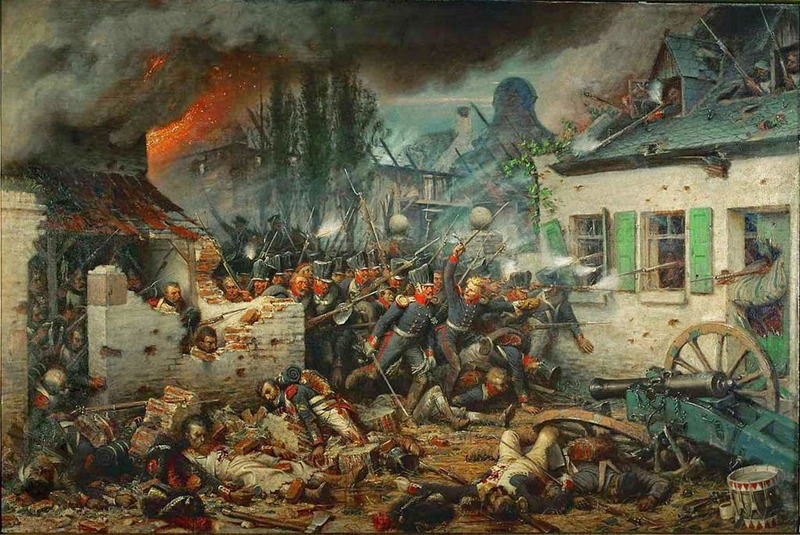 Napoleon for his part watched impotently as the Prussians easily scattered the wounded General Domon's 3rd Cavalry Division of less than a thousand men at five o'clock. 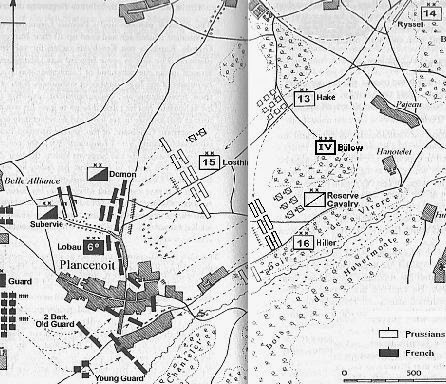 But three brigades of Comte Lobau's VIth Corps, supported by thirty pieces of artillery, promptly challenged Bulow's equal ordnance and swelling infantry, successfully pushing them back for the moment. However tired the Prussians may have been from their forced march from Wavre today, nonetheless, with the rest of Bulow's corps now arriving, they had a crushing numerical superiority with their 31,000 against Lobau's 7,000, and by six o'clock the French had again abandoned Plancenoit. Coming under Prussian cannon fire himself for the first time, Napoleon dispatched General Duhesme's Division of eight battalions of Young Guard infantry, totaling over 4,000 men, along with twenty-four pieces of ordnance. Duhesme retook Plancenoit, so critical for maintaining the French right flank, while Durutte attacked Papelotte. This was no time for half measures. But capturing Plancenoit from the mortally wounded Duhesme, Bulow once again threatened Napoleon and French control of the Bruxelles Road itself. Meeting this challenge, the Emperor then deployed eleven of his remaining Guards battalions in as many separate squares, from La Belle Alliance along the Bruxelles highway down to Rossommee Farm. Now facing east toward a wall of massing Prussians, he ordered another attack on Plancenoit, led by two battalions of Morand's Old Guard chasseurs. By 7 P.M. not only was that village of 500 souls again back in French hands, but Papelotte and La Haie secured by Durutte's 4th Infantry Division as well. Experience had won the day. Lobau had regained all the land he had earlier lost.